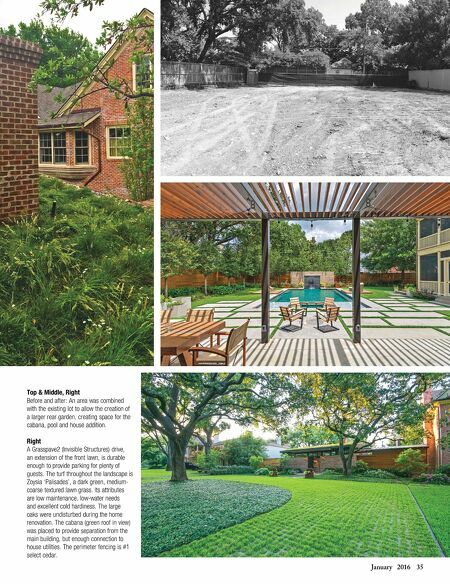 January 2016 35 Top & Middle, Right Before and after: An area was combined with the existing lot to allow the creation of a larger rear garden, creating space for the cabana, pool and house addition. Right A Grasspave2 (Invisible Structures) drive, an extension of the front lawn, is durable enough to provide parking for plenty of guests. 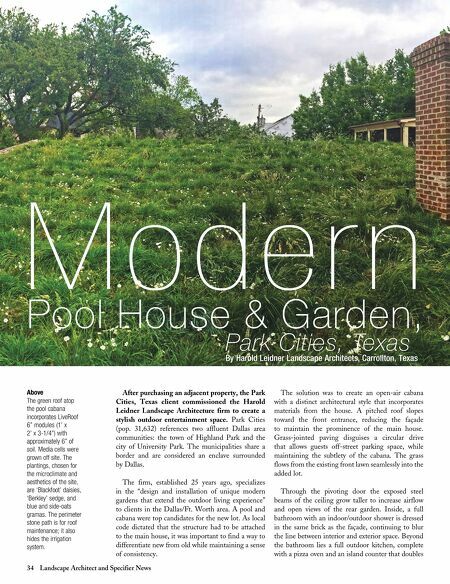 The turf throughout the landscape is Zoysia 'Palisades', a dark green, medium- coarse textured lawn grass. Its attributes are low maintenance, low-water needs and excellent cold hardiness. The large oaks were undisturbed during the home renovation. The cabana (green roof in view) was placed to provide separation from the main building, but enough connection to house utilities. The perimeter fencing is #1 select cedar.